It’s been over a year since I bought my Brompton folding bicycle to help cope with my long-distance commute from Eastbourne. I have to admit there was a steep learning curve to get the complex folding system (there is only one way to do it right – but lots of ways to do it wrong). And adapting to the hyper-sensitive steering (which does become something of an advantage once mastered), took much longer. But apart from these early niggles, the bike has been a joy to own and use. 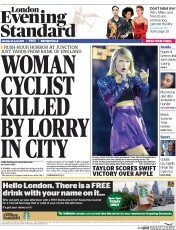 The almost daily stories of death and injury, often appearing on the cover of Evening Standard, make me question the risks I am taking. Having to share the road with tipper trucks, articulated lorries, and buses. They are noisy, big and scary for a cyclist. Fellow cyclists who blatantly ignore red lights. I can see the temptation to get going, but they give all of us such a bad name. Taxi drivers who squeeze you into the curb. I wonder if it is deliberate, or perhaps they just didn’t they see me? On reflection I would say a combination of their skill and experience, probably means it is a conscious action. Teenage scooter drivers with some kind of ‘death-wish’ who cut through the smallest of gaps and swerve across multiple lanes of traffic. Pot-holes, which seem to multiply nearer the edge of the road (where I want to cycle), forcing me out into the path of cars and vans. Pedestrians with headphones and tunnel vision, determined to cross their patch of road, often right in front of me. They seem entirely oblivious to the world around them. 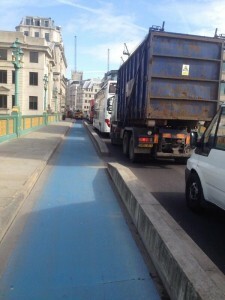 Badly thought out and implemented cycle lanes. For instance my daily route takes me over Southwark Bridge with its blue cycle highway. On the bridge I feel nice and safe with a concrete bollard between me and the heavy construction lorries. But coming off the bridge, I have to filter through three lanes of those monsters, praying the lights don’t chance until I get to the safe haven of the cycle box at the front. It is genuinely scary. Cobbled back streets. I love the fact that London is steeped in history, but my bottom would appreciate some smoother tarmac please. Mental health. According to an Evening Standard, one of the best ways of helping to develop a Mindfulness approach to live is to cycle regularly. Exercise. I can feel my legs getting stronger and my stomach getting a bit smaller every time I swing my leg over the Brompton’s saddle. Surprising pedestrians. My favourite trick is to stop for pedestrians as they step onto a zebra crossing. I usually have to wave them on, as they think it is some kind of trick, having become accustomed to cyclists cutting in front of them. Getting to work on time. I can usually get to work five minutes earlier than if I changed trains and relied on Thameslink to get me across central London. Knowing I can fold my bike up and get on the tube if necessary. So far I have only been ‘rained off’ once. Being able to get from Kings Cross to Oxford Circus in 15 minutes. It’s even quicker than the tube. 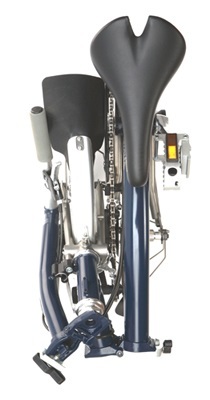 This entry was posted in Design, gadgets, going green, inventions, travel, work/life and tagged Brompton, commuting on 29 June 2015 by ninfield.